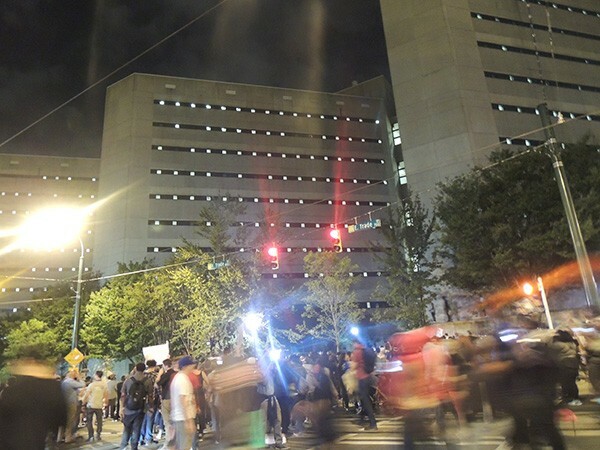 On September 23, 2016, hundreds of protesters marching through the streets of Uptown Charlotte stopped outside of the Mecklenburg County Jail on East 4th Street to show solidarity. As some inmates inside flicked their lights on and off in recognition, the protesters chanted, "We see you, we hear you, we love you." Less than a month later, the Mecklenburg County Sheriff's Office passed new rules regarding inmate visitation that has since made it harder for those inmates' loved ones to see them, harder to hear them and harder to show their love for their incarcerated family members. In October 2016, the MCSO quietly ended in-person visitation for its inmates, 64 percent of whom have yet to be convicted of any crime and are still innocent in the eyes of the law. The prison visitation scenes depicted in movies where families sit together at a table, watched by a guard, or speak on a phone through a pane of glass are obsolete in Charlotte in 2017. Visitation is now conducted exclusively via remote video chat over the internet. The service is provided by a corporation called GTL, which markets it as a Skype or FaceTime for prisons and tells tales of a world where prisoners' lives are enriched by stretching communication beyond cell walls. "I enjoy hearing all the stories about inmates who, through internet visitation, are able to attend their child's birthday party or see the pet they love, all things that are not possible with traditional visitation methods at a correctional facility," writes a GTL product manager on the company's blog. However, some people are concerned that this development is not as positive as the marketing spin would have you believe. One problem is cost. The sheriff's office offers one free 25-minute visit per inmate, conducted at the Work Release and Restitution Center on Elizabeth Avenue. If the inmate wants any other visits that week, they must schedule an off-site internet visit at the cost of $12.50 per 25-minute session. The costs of the service on top of other fees normally paid by inmates' families — such as for hygiene necessities, food and legal representation — can be a serious challenge for middle-class families to keep up with. They present an insurmountable obstacle for those families who are already economically disadvantaged — a population over-represented in the justice system. Former MCSO inmate Dannielle, 31, who did not want her last name used in this article, estimated that her family spent $50 to $80 a week while she was locked up in order to maintain regular contact with her and ensure her basic needs were met. That figure is in line with those in a sweeping study conducted in 2014 by the Ella Baker Center, which found that one in three families with a loved one in prison goes into debt trying to cover the costs of keeping in touch with them. Prison communication companies are notorious for price-gouging families that want to maintain contact with loved ones. Fans of the Serial podcast may remember GTL by its previous name, Global Tel*Link, which provided communications services in the prison housing Serial's subject, Adnan Syed. When that season was over, Bloomberg Media, which published Serial, estimated the cost of the 40 hours of phone calls recorded on the podcast at about $2,500. The Obama Administration sought to cap the soaring prices of prison communications, but the providers, including GTL, fought back with lawsuits. Earlier this year Ajit Pai, Trump's appointment to chair the FCC, announced the agency would not work to defend the regulations under his leadership. Cat Bao Le, founding director of the Southeast Asian Coalition in Charlotte, helps area immigrant families when a loved one gets caught up in the justice system. Most of the organization's casework — which includes translation, showing up at court dates and explaining to families what comes next — is with juvenile inmates, but one youth the organization worked with recently turned 18 and was brought into a pod with adult inmates at the Mecklenburg County Jail. It was then that Le became familiar with the effects of the switch to video monitoring. The inmate's family members are Vietnamese immigrants with no understanding of English and no access to the internet. "Going to video has been so difficult for this family," Le says. "Being able to drop in with two or three family members during that designated time and going in to see someone cuts out the literacy divide, the digital divide, the cultural divide, the monetary divide. They're illiterate, they're indigenous people from Vietnam, they don't even know how to read in their own language. Not being able to speak English, not having transportation — and we don't have a way we can contact them otherwise, so we just have to drive over there. And you have to register [for video conferencing] 24 hours in advance. Before, you could just put their names down, whoever's going to visit, and you could go in. Now there's just so many different steps." Perhaps more important than the economic concern for families is the safety for prisoners and guards that results from eliminating face-to-face contact between inmates and their loved ones from the outside world. Oftentimes, anticipating the arrival of friends and family gives prisoners the hope and resilience they need to make it through their incarceration. Person-to-person visits can motivate prisoners to keep on the straight and narrow until they can resume those relationships on the outside. The visits give the inmates a sense that there's a world waiting for them to return to. A 2014 study by the Texas Criminal Justice Coalition found that two years after the Travis County Jail, in Austin, instituted video-only visitation, disciplinary infractions climbed 42 percent and inmate-on-inmate assaults increased 20 percent. Furthermore, disciplinary action for possession of contraband increased 54 percent within the first year, and inmate-on-staff assaults doubled almost immediately after visitation was removed. That data paints a much darker picture than the feel-good anecdotes of the birthday parties and pet visits featured on GTL's website. Le recognizes that video visitation has its positive effects, but emphasizes it should be used as an additional option or reward for inmates. "There are some positives to the video conference; if you're in another state, that's important that you can talk to your loved one," Le says. "And that it's at any time. Before, it was when your pod had a certain time or a certain day . . . but I think it needs to be a mixture of both and not just either/or, because it leaves out a whole big segment of the community, which happens to be the community that's already marginalized and are in jail and can't get out." "Global Tel*Link knows that video visitation on the web is an effective complement to traditional visitation methods — not one meant to replace them," the company marketing reads. "We are trying to fill the gaps left by traditional visitation methods and aim to make communicating with loved ones easier for those that are challenged by distance or time constraints. Some in our industry have [been] pushing for the elimination of in-person visitation when facilities implement remote video visitation, but GTL recommends providing a spectrum of options rather than dictating the terms of visitation in any specific facility." Furthermore, even inmates with the resources to access video visitation are often left feeling disconnected from family in more ways than one. Despite companies like GTL painting their service as comparable to widely-used services like Skype, many say the quality isn't comparable. Bastrop County Jail in Texas reported that despite eliminating in-person visits, video visitations were in less demand than had been expected. Only a couple dozen inmates per month requested the service, while most were turned off by the high cost and poor quality. Dannielle, the former Mecklenburg County inmate CL spoke to, said the quality of video visitation here is equally bad. Dannielle, 31, says she wasn't able to see her daughter during her 45-day stay at the jail, other than seeing her through a screen that rarely worked. "The video chat would go in and out. Sometimes half the screen would be cut off, and sometimes they wouldn't work at all," Dannielle remembered. "You wouldn't even get your visitation; you would have to wait until the next week, because even though the system was down, they would not make up the visitation you missed." According to the refund stipulations listed on GTL's brochure, full refunds are only given if the "visitor" cancels more than 48 hours before the visit, or if the jail cancels the visit for any reason, not for glitchy service that cuts a visit short. When asked why it decided to end in-person visitation, the Mecklenburg County Sherriffs Office pointed to an October press release stating, "This new service will allow Detention Officers at Jail Central and Jail North to continue to ensure the safety of all visitors, inmates and staff by limiting the movement of inmates within the jail." That seems an unlikely rationale given the findings of the Travis County study. So, what is the real reason? Most likely, revenue. The Texas Criminal Justice Coalition's analysis of contracts between counties and prison communications corporations estimated counties receive, on average, 23 percent of the profits made from calls and video visitations. Sometimes they're also guaranteed an additional amount on top of that. For instance, GTL guaranteed $15 million to Los Angeles County within the first year of implementation. Video visitation is likely a lucrative venture for Mecklenburg County, with poor families paying the cost and support networks breaking down as a result. Unlike a federal prison, almost all of the inmates at the Mecklenburg County Jail will be returning to a street near you at some point. When they do, their ability to thrive in regular society depends on their support network. A decade of research shows how maintaining these relationships while they're incarcerated lessens the likelihood of repeat offenses. A 2011 study by the Minnesota Department of Corrections found that prisoners who received even one in-person visit from a loved one were 13 percent less likely to commit new crimes and 25 percent less likely to violate parole. 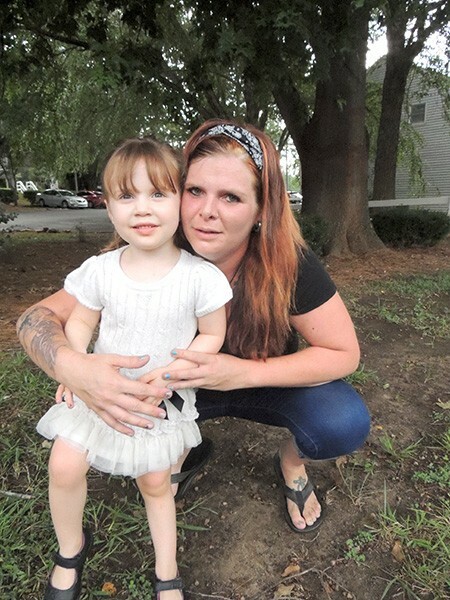 Dannielle's stint in the Mecklenburg County Jail was 45 days, in which she missed her daughter's third birthday and was never able to see her except on a screen that rarely worked well. "When you are in there not being able to see your family and your kids, it feels like you're being even more removed from society and it feels like you are less than a human being," she said of the experience. Which begs the question: When someone who has already been placed in a pen is being made to feel even less like a human, what is the endgame? *Ryan Pitkin reported on and contributed to this story.